Delegate: Mr. Harald Rikheim , The Research Council of Norway. Consultancy meetings have been held with the Ministry of Petroleum and energy in connection with the Ocean Energy Act (Havenergilova), taking effect through the implementation of secondary legislation. Offshore power production is to be regulated through the Ocean Energy Act, which is expected to have secondary legislation enacted by year’s end. Additionally, expectations are for offshore power production, including wind power, to be connected to facilities connected to the oil and gas extraction on the Norwegian shelf; that means additional regulation from the oil and gas sector may come into play. Norwegian ocean energy is under the domain of the Ministry of Petroleum and Energy. Under the Energy Act, the Norwegian Water Resources and Energy Directorate (NVE) was the relevant regulator – expectations are for this to remain as the Ocean Energy Act is being fully implemented. The Norwegian Government has not implemented a coherent ocean energy programme. A “strategy for floating offshore wind” has been published, but it does not contain any specific targets, or overreaching support and incentive structures. Since 2012, Norway and Sweden have been in a joint green certificate market. One certificate per MWh has since 2012 been given to all new renewable energy generation for 15 years, independent of technology. From year 2022, Norway will no longer participate in the scheme, while Sweden will increase their target build-out under the scheme with 18 TWh by 2030. Norwegian energy production that may be certified for certificates until 31.12.2021 in the so-called transitional scheme; however, Norwegian projects will receive certificates only until 31.12.2035, even if the project is approved for certificates under the transitional scheme. The Norwegian Energy Agency, Enova offers capital grants for full scale demonstration projects of ocean renewable production. While up to 50% of eligible costs can be covered, Enova’s funding measured in absolute figures is limited. In addition, Enova has a programme that supports demonstration of new energy technology, on the basis that the technology is applied in Norway. Innovation Norway runs a programme supporting prototypes within “Environment friendly technology”. Ocean energy is included in this definition. Projects are supported with up to 45% of eligible costs. The Research Council of Norway runs an energy research programme called ENERGIX. This programme supports R&D within all renewable energy technologies. Stadt Towing Tank (STT) was founded in 2007 to deliver test and research services to the marine industry. The main market for STT has been ship designers in the maritime cluster of north-western Norway, but projects related to renewable energy are also tested. Among the renewable energy project has been wave energy converters, windmill installation concepts, wind turbine foundation solutions and wind turbine service vessels. Runde Environmental Centre (REC), located on Runde Island on the Norwegian west coast (http://www.rundecentre.no), can accommodate WEC plants for test and demonstration at several sites. One has a 3 km/0.5 MW sea cable to shore with grid connection. REC facilitates preparations, licensing, deployment and monitoring of the WECs, and works also on other forms of ocean energy, building national competence and capacity. REC hosts other sub-sea tests, for anti-corrosion and anti-fouling. In 2016, a new bathymetric dataset, with 1x1 m resolution was released by REC, for public use. This unique material is very useful when it comes to licensing and siting of OE devices in the area. The same applies to the wave forecasting model installed, in co-operation with the Norwegian met office. The first operational, grid connected wave energy buoy project in Norway was launched on 2 June 2017. The Swedish technology company Waves4Power has developed and produced a 100 kW energy converter, which is currently undergoing long term grid connected testing at the Runde Environmental Centre (REC). The anchored buoy, Wave-EL, is connected to a stand-alone buoy-mounted transformer. The transformer is readied for additional 9 connections, and so a powerplant-sized future demonstration is technically feasible. Fred Olsen BOLT Lifesaver is undergoing a second round of tests at the US Navy’s Wave Energy Test Site (WETS) on Hawaii, to power an oceanographic sensor package. Norwegian Ocean Power has been developing a tidal device using a Darieus-turbine H300A of 300 kW and they have now permission to install their prototype in Lofoten. Offshore renewable energy is governed by the Ocean Energy Bill since 2010. According to this legislation, licences to build offshore wind, wave and tidal farms in certain far shore geographical areas cannot be given without a prior governmental process where suitable areas are identified. This legal framework is very much inspired by similar legislation in the Norwegian petroleum sector. As a follow up on the Ocean Energy Bill, a group of relevant governmental bodies has identified 15 areas that could be suitable for large scale offshore wind power. The selection of the 15 zones was carried out through a screening where technical opportunities were analyzed along with impacts on petroleum interests, shipping fisheries and a range of environmental interests. Applications for ocean energy production are not being processed in Norway at the moment because the Ministry will decide which zones are to be opened for license applications. These decisions are under process. The decisions regarding license applications for ocean energy projects are under process. According to this situation, this topic is not relevant at the moment. At the moment, the legislations and regulations for consenting process on ocean energy fall under the Ocean Energy Act of 2010. There as decisions regarding opening zones for license applications are still under process, there is no authority responsible to manage the consenting process today. Consenting processes for onshore energy production governed by the Energy Act is managed by the NVE. 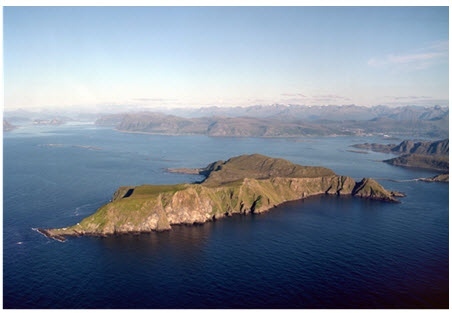 Runde Environmental Centre (REC), located on Runde Island on the Norwegian west coast facilitates preparations, licensing, deployment and monitoring of wave energy devices.